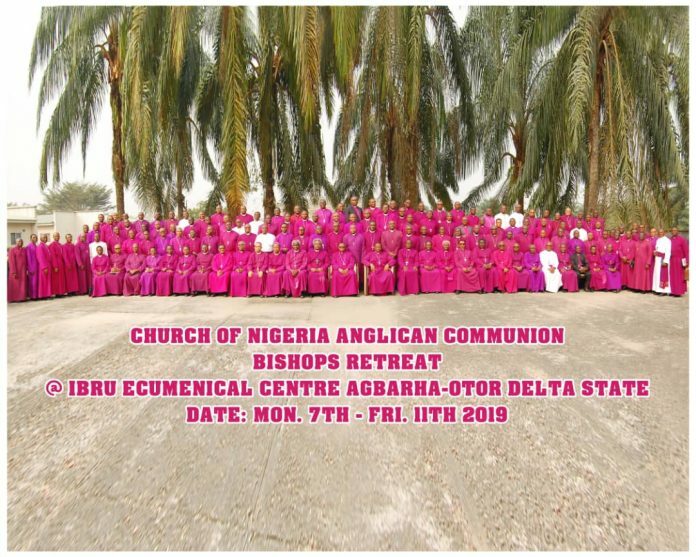 A statement released at the close of last week’s meeting of the House of Bishops of the Church of Nigeria. Note: The appointments were not made in consultation with the ACNA college of bishops. The Ibru International Ecumenical Retreat Agbarha – Otor, Delta State hosted the Primate of All Nigeria, Most Rev’d Nicholas D. Okoh, the Dean of the Church of Nigeria, the Most Revd Ali Buba Lamido, all the Archbishops and Bishops of the Church of Nigeria (Anglican Communion) from Monday 7th to Friday 11th of January, 2019. The programme is the annual retreat with which the bishops start the year with special reflection and prayers. The theme of this year’s retreat is “The Integrity of the Church Today and Tomorrow.” The bishops devoted time to be alone with God for refreshment in His presence for renewed vision and direction for leading the church of God in the year. The retreat among other things featured quality sermons delivered during the Holy Communion Services and the Mattins, Bible studies and inspiring lectures delivered by some learned and experienced bishops. The Primate of All Nigeria charged the bishops to prove themselves men of integrity in their words and conduct both privately and publicly. Prayers were said for the nation, particularly for peace in troubled areas and for a peaceful electoral process. The Programme ended with Episcopal Synod in which some new bishops were elected to join in the shepherdship of the Church of God. The four are elected and appointed Bishop Suffragans for four newly created regions while The Rt Rev. Amos Fagbamiye maintain servant leadership in the geographical area of emphasis with the Cathedral in Indianapolis.